In the 2019 season our club teams will be training at Jindalee State School, Cnr Wongaburra and Burrendah Roads, Jindalee. Training will be on Tuesday, Wednesday and Thursday's each week. Players will be notified by their Coaches of their training time and day. Weekly Games: All Non Competitive and Competitive games are played on a Saturday's (excluding school holidays) at Western Districts Netball Association (WDNA), Faulker Park, Graceville. We are an affliated club of WDNA. Just a quick reminder about parking correctly around the netball courts at all times. This is for the safety of all our club members when accessing the grounds, and out of respect for our neighbours. Please be mindful of not parking in the loading zone, where there are yellow lines marked, nor parking in the neighbours driveways. Anyone breaching these rules are at risk of being fined by Brisbane City Council. Also a reminder that the WDNA car park is reserved for WDNA Committee and Life Members only. 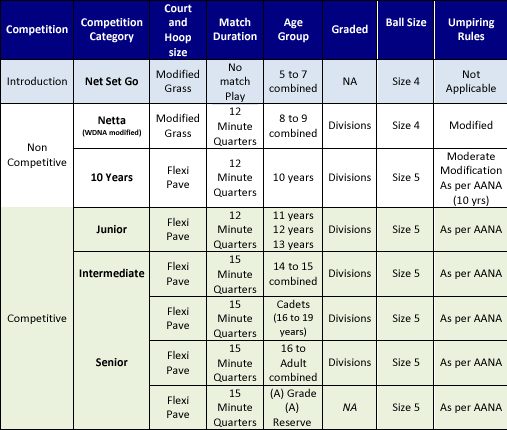 *The Introduction Net Set Go Competition Category has now changed to 5 to 6 Years Combined. *The Netta (WDNA Modified) Competition Category has now changed to 7 to 8 Years Combined. *The Non Competitive Category has now changed to 9 Years & 10 Years. Training is held once a week on either a Tuesday , Wednesday or Thursday at Jindalee State School courts. Players will be advised of training times by their Coach and all players are expected to attend training unless they have notified their coach due to sickness, injury or personal matters.